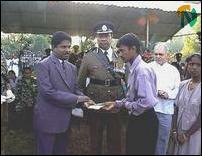 Mr.M.Ilancheleyan the District Judge for Vavuniya district is seen giving away the cash prize of Rs.15,000 for bravery to Richard David Remsy Teroni for his bravery while his mother Vethanayagi is seen at the extreme right. Teroni's father, David Richard who was injured during the incident was awarded Rs.7,000 and his mother Vethanayagi Rs.3000 for their act in confronting the burglars, sources in Vavuniya said. Assistant Inspector General of Vanni region Mihinda Bandara Beddewela Vavuniya Senior Police Commissioner J.M.Miskin, Assistant Police Commissioner Ranjit Kasthuriarachi, Vavuniya Head Police Inspector Wijeyanayake participated in the ceremony as special guests, sources said. Police officers, Women officers, Police Special forces, and officers of Police Intelligence wing participated in the parade.